Royal Mail’s vision is to be recognised as the best delivery company in the UK and across Europe. 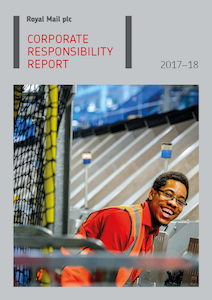 In an increasingly challenging and competitive marketplace, Royal Mail has continued to put the principles of corporate responsibility at the centre of our business strategy. Royal Mail believes that this holds the key to delivering sustainable value for our shareholders, now and in the future. Royal Mail Group was named global leader in the Dow Jones Sustainability Indices for the Transportation industry group, and ranked in the top eight per cent of companies in the FTSE4Good Global Index. Royal Mail makes the 7th biggest contribution of any UK corporation to the UK economy. During 2017-18, it contributed £10.1 billion. 34 per cent of new supplier contracts were awarded to Small and Medium-sized Enterprises. Royal Mail was recognised for the fifth consecutive year as a Times Top 50 Employer for Women. GLS Denmark was rated one of the country’s best employers by the Great Place to Work Institute. Royal Mail opened 86% of its UK customer service points on Christmas Eve, a Sunday, to ensure that customers could collect their parcels before Christmas Day. GLS launched its ShopReturnService to seven European countries, offering online shoppers an easy way of making international returns. Royal Mail contributed £7.1 million directly to charities, good causes and schemes for disadvantaged groups. Employees raised a further £2.7 million, including £2.3 million through payroll giving. GLS Spain worked with the mental health charity Apunts to build people’s confidence and develop crucial workplace skills. Royal Mail reduced its UK carbon footprint by 4.6 per cent compared with the previous year. It was 29.1 per cent lower than the 2004-05 baseline. GLS added a number of alternative fuel vehicles to their fleet, including five electric vehicles in Spain and 10 natural gas vehicles in Romania.